Have you already tried JetPopup plugin with its awesome popup templates library? There are over 60 specific templates made for adding a contact form, MailChimp popups, the popups designed for showcasing countdowns, deliver information about discounts, etc. In most cases, it’s more than enough. However, once you want a true freedom of choice, you might want to get even more popup templates offering classy designs to suit your topics, with even more stylish layouts and content variations. Yes/No popup template, that contains popup action buttons. There is also a huge 10-pieces popup package providing popups made for special occasions, that can be used on holidays. All you need to do to get one of the popup packages is proceed to CrocoBlock Extras > Popups page and here click Purchase under the bundle you’ve selected. After that you’ll be redirected to Checkout page, and after the payment is processed, the bundle will become available in your personal CrocoBlock account. Download it to your hard drive to get all the .json popup templates for JetPopup plugin. First, before importing the popup templates, make use to extract the .json files from the.zip archive package you’ve previously downloaded to your hard drive. To import and apply the new popup templates log in to WordPress Dashboard and here navigate to JetPopup > All Popups block. Here click Import Popup button. Browse the folder with the popup .json templates you’ve previously extracted from the Popup Bundle .zip archive. Then click Import Now option to start the import. 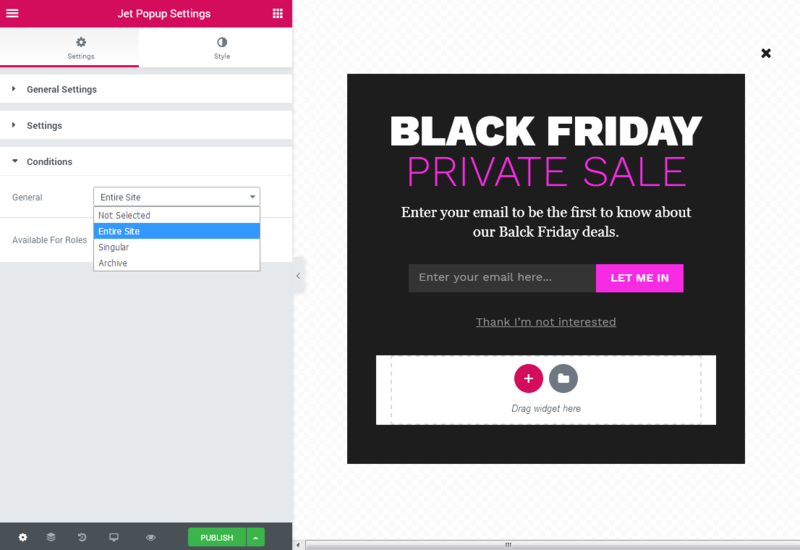 After that the new popup template will become available in the All popups list. Hover over it and click Edit with Elementor option to view it and make any changes in it in case this is necessary. Don’t hesitate to change the popup conditions in Jet Popup Settings block to define where the brand new template should open, set it for the specific page, etc. 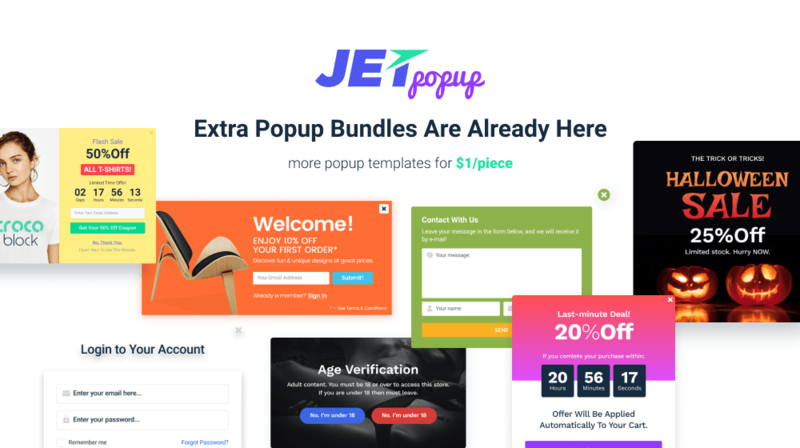 The extra popup template bundles for JetPopup plugin for Elementor are made with the thought of your utmost convenience, so it’s not necessary to have any coding skills to use them. The templates are really easy to import and use. These bundles are the must-have resources you’ll definitely need if you want to make your popup templates more versatile and don’t want to spend more time on creating your own designs of the popups.